Fresh Off The Boat FYC Q and A! Meeting Constance Wu! Randall Park! Hudson Yang! And More! mike March 8, 2017 Fanboying! 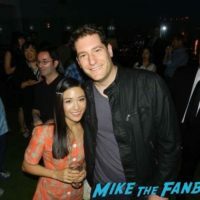 One of my favorite shows, that seems to flying just under everyone’s radar has been Fresh Off The Boat. The series is hysterical! I don’t know if you’ve seen it yet, but if you haven’t, stop what you’re doing, head to iTunes and download a few episodes.